The "Grinder Tool Rest" took me about fifteen minutes to install and that counted cutting the counter top scrap to size, and mounting my grinder. 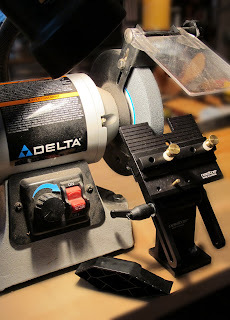 I then used the setup to perfectly, and easily grind a 30° angle on a beater chisel that is now ready for further hand sharpening and honing. 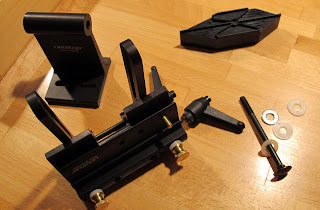 I'd probably grind these in batches of similar angles to save time adjusting the jig. 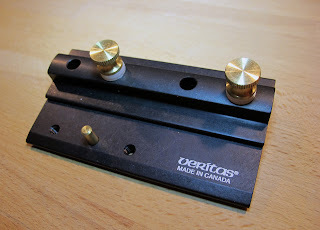 I'll be including some details on how I use this tool rest and jig in my upcoming video on powered sharpening methods. There are a ton of these types of jigs out there, I just happened to choose this one because of its availability (it was in the store when I was looking for one) and the fact that I have had other successes with other Veritas tools. The "Grinding Tool Rest" comes with instructions on the distance it needs to be from the body of the grinder, and the distance the hold down bolts need to be from each other. 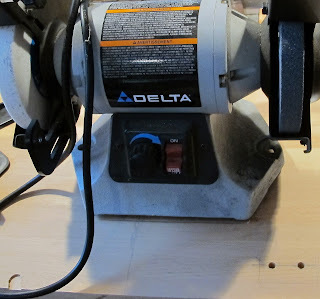 I just laid everything out in pencil and drilled holes accordingly. Underneath the tool rest I used a 7/8 inch forstner bit to provide a relief in which I set the nuts. The instructions recommend using wingnuts underneath in case you need to adjust the tool rest but I just used serrated flange lock nuts (shown below) because I don't foresee having to move this from underneath much. 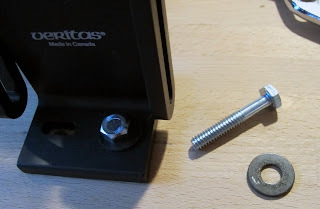 I made sure that the bolts ended up flush with the bottom of the mounting board so that I can slide this around on whatever surface on which I need to put the grinder. The board that I mounted the grinder on is a scrap from my kitchen counter tops. If you don't already know, Ikea sells counter tops which are awesome. They have butcher block style wooden counter tops made of various different lumber species which are both decent looking and relatively affordable. They come in different sizes, which are prepackaged and usually available right in the store so you don't have to go through the hassle of ordering them. They have come a long way with their newer lines and they all finish beautifully with just wipe on poly or salad bowl finish. I have scraps from these counter tops sitting in my shop that I use for all kinds of projects. I also bought a large piece as a work bench top for my wife to use and she is extremely happy with how heavy and durable it has proven to be. Ikea can be a great source for hardware and materials, but remember that a lot of their furniture is made of rice paper, super glue, and butterfly wings.